Ayyanar or Sathanar worship is a very ancient ancestral clan-based worship system linked to nature and fertility worship. The festivals of Ayyanars,a popular village deity in and around madurai are celebrated in Sacred Groves during spring season by all the related clan. 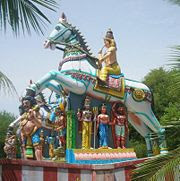 Ayyanar shrines are usually located at the peripheries or boundaries of rural villages and the deity is seen riding a horse with a sword. Weapons such as a trident or a lance are also associated with the shrine. Most officiating priests are non-Brahmins and derive from local lineages that had initiated the cult centers generations ago. The worship pattern is non-agamic and is associated with sacrificial offerings of pure vegetarian food. However animals such as chicken and goats are offered to few of the selected 21 associate deities (Kaval deivangal) such as Karuppa samy, Sudalai maadan samy and some other Amman deities located within Ayyanar temple for favors. In return the local priest might offer holy flowers or Veeputhi (holy ash) to the worshippers. Folk Tales like koothu and Folk arts like villupattu are enacted to bring out the message of the Ayyanar folk story to one and all.